where they encrypted the traffic between players and the game server using ECB. So every time the player did something, it sent a message to the server, and the server sent back a message telling it how to respond. formed a very effective exploit. to use a mode of operation that doesn’t just blindly concatenate things. “1”, once with “2”, etc. Repeated blocks won’t look repeated in the ciphertext. the same thing. For each of the modes of operation I describe below, I’ll provide similar pseudo-code and diagrams. CTR just use a plain counter – the only variation is that it often doesn’t start the counter at 0 or 1.
below). People monitoring the network would be able to detect that a single encoded block would be sent each time a player killed a monster. But they wouldn’t know what the specific payload of the message was, and they wouldn’t be able to guess how to encode a copy of the block in a way that would work. becomes relatively easy, and you’ve got lots of different blocks, some of which may (by chance) be easy to break by brute-force methods. replace the IV with some kind of output from the previous block. 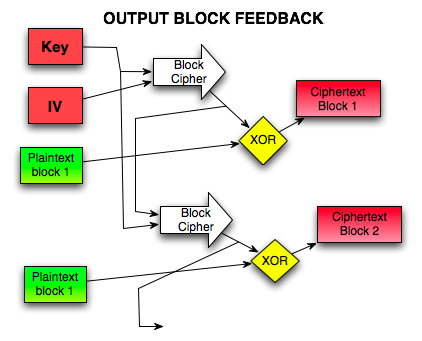 IV for the second block; the IV of the third block is the output ciphertext of the second, and so on. So each block is scrambled by mixing it with the ciphertext of the previous blocks. This also avoids the problem of the game, because the same plain text message encrypts to different ciphertext each time. with the previous IV to create the IV for block 5. CFB has pretty much the same vulnerabilities as CBC. from step N, before it’s exclusive-OR’ed with the plaintext for step N.
some feedback from the previous block – the plaintext gets exclusive-OR’ed afterwards. 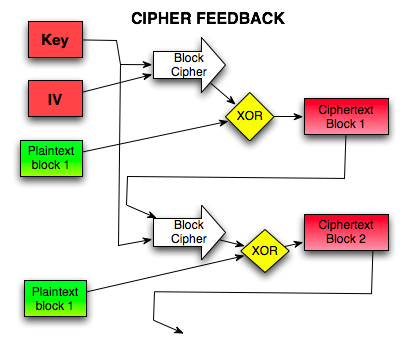 later posts, I’m going to talk a bit about the cryptanalysis and attacks that are used against block ciphers, and how they interact with different modes of operation. From there, we’ll be able to see why these modes don’t protect integrity, and show how we can build modes that focus on integrity. Mark, your description of counter mode is completely wrong. The plaintext input is not mixed with the counter before encryption. Counter mode means encrypting only the counter itself, then XORing the cipher output with the plaintext. 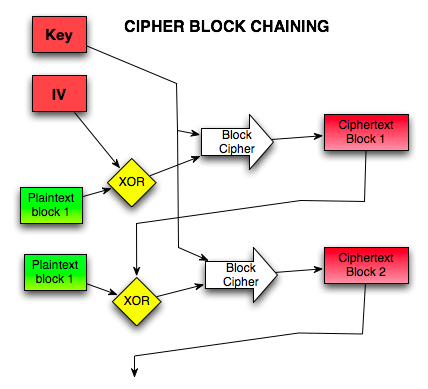 In other words, it turns a block cipher into a stream cipher. Your latter description (i.e., “counter function”) sounds like you’re thinking of GCM (Galois Counter Mode). I like your blog overall, but this series on crypto is a bit dangerous for amateurs. The devil is in the details, and it’s very easy to make a critical mistake. So while it’s good to give people an intro, I suggest a big warning letting them know that there are some dangerous assumptions lurking below the surface, and that they should always use well-reviewed implementations and protocols (i.e. SSL) rather than rolling their own for pure ego reasons. Please consider posting a correction to your blog to avoid misleading people. Thanks for the correction. I’ve marked it as incorrect, and I’ll fix it after work, when I have some time. I disagree with the idea that talking about crypto is “dangerous for amateurs”. It’s dangerous for amateurs to think that they can go off and be cryptographers without bothering to actually study crytography – but for a series of posts that just tries to explain “what is this stuff?”, I don’t see the danger. I don’t pretend to be an expert on crypto, nor do I represent my explanations as anything more than very high-level intuitive descriptions to give people a clue of what’s going on. I don’t think that anyone is going to mistake this basket of blog posts for a serious primer on how to become a cryptographer, or how to build and analyze cryptosystems, any more than I think that people are going to think that they’re group theorists because they read my group theory posts. The series on cryptography has been very interesting so far, thank you for the time and effort you are putting into it. I am just barely keeping up with whats going on 🙂 The modern crypto techniques are amazing, but I still cant help wondering about security and attacks against mysterious systems. Most of the modern encryption algorithms are very well studied. How difficult is it to take a piece of encrypted message, that has been encrypted by an entirely unknown system, and break it? Might security through obscurity work if I came up with my own methods? Assuming the encryption and decryption processes are completely unknown, Id love to hear your speculation on the strength of systems. Would modern cryptographers just rip my encryption apart like it’s wet toilet paper? One of the basic assumptions of information security is that the sufficiently motivated attacker WILL know your algorithm. Bribes, theft, blackmail, court orders and incarceration for contempt of court, whatever it takes. On top of that they probably have an idea of what you’re sending. Historically that might have been “From: X; To: Y, etc.”, today it might be a compression header followed by a compressed word document header. Worser case, they’ll have samples of your plaintext. Worserer case, they’ll have samples of plaintext and corresponding ciphertext. Worst case, they can feed arbitrary plaintext into your system and see what pops out. So your security has to rest in your keys. Nothing but your keys. Obscurity and misdirection(*) will help protect you from the casual attacker, but can’t be relied upon. That’s why you have to get the algorithm right -and- pick good keys for that algorithm. That’s extremely hard to do on your own. (*) A good example of misdirection are the id cards that use a barcode that’s behind a plastic strip that’s transparent to IR, opaque to visible light. Casual attackers will think it’s a magnetic strip. My intro to crypto class (at the grad level) had a few “here, crack this” problems, but they were pretty restricted since it was more theory than practice. Lots and lots of number theory. 🙂 We only did cryptanalysis problems that could be done by hand in a reasonable amount of time. Anyway, it was basically a process of looking for structure that gave us insight into the cipher, after making assumptions about the ciphertext (e.g., that it’s simple English text). Count the occurance of each ciphertext symbol — a distinctive pattern of spikes could indicate a simple substitution cipher. Didn’t work? Sort the ciphertext symbol into bins. You might see those spikes in each bin when you use, oh, 7 bins. That indicates a substitution cipher with 7 rotors (or whatever they’re called — it’s been years). Still didn’t work? Try looking for the structure you see with a Playfair cipher. On and on. I don’t know how you distinguish between, e.g., DES vs. AES vs. some new cipher developed by the Russians. Hopefully we’ll see that in later posts. Your discussion of the security issues with CBC mode don’t make much sense to me. In general, all the chaining modes are vulnerable to brute force attacks. That’s just a consequence of the fact that given the ciphertext and the key, you can decrypt to get the plaintext. Were you trying to get at the idea that CBC mode doesn’t parallelize well on the encryption side? If you give me 100 processors, I still can’t do CBC encryption of a single long message any faster than with one processor. Or something else? Also, your text description of CFB mode is confused. Your code and diagram look right (the ciphertext from encrypting plaintext K should be encrypted to generate the thing that gets XORed into plaintext K+1), but the text is messed up. And one nitpick: Your OFB code (it looks right otherwise) is titled EncryptWithCFB. So, if I’m reading this right, OFB is essentially a “simulated” one-time pad. Instead of using a truly random pad, you use the block cipher as a pseudorandom number generator and build the pad from that. Then you can rebuild the pad as long as you have the seed (the key and the IV). (Naive user) Why not encrypt once to provide confidentiality and then again (different key) to ensure integrity? When decoding, first decryption ensures preserved integrity and the second, preserved confidentiality. In the same vein,does successive (serial)encryption offer any advantage in confidentiality? How does successive encryption (different keys)scale? Is it just as easy, twice as difficult . . . to decrypt? This series has been included in the 40th Carnival of Mathematics. Come check out the others. The CTR mode description is still incorrect. What you do in CTR mode is to encrypt successive integers ctr, ctr+1, ctr+2, … and then XOR the plaintext blocks with those ciphertexts. Decryption is just the opposite: you peel off the encryption by XORing the ciphertext with the encryptions of ctr+i. use the same ctr+i twice is negligible. – The encrypter is stateful, that is, he remembers ctr. As for counter function, one usually just increases ctr by one. How would you explane the basic operations in cryptography?